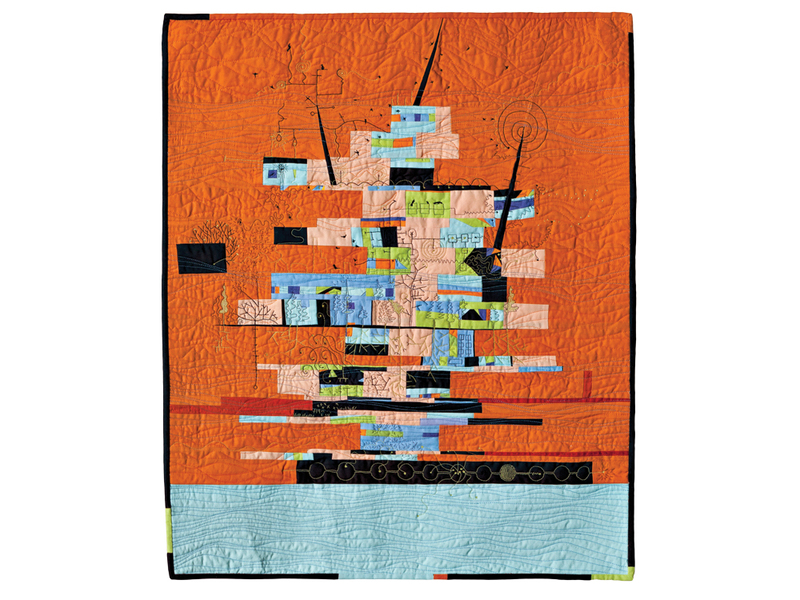 In her dazzling and detailed quilts, Paula Kovarik traces big ideas about life on Earth. 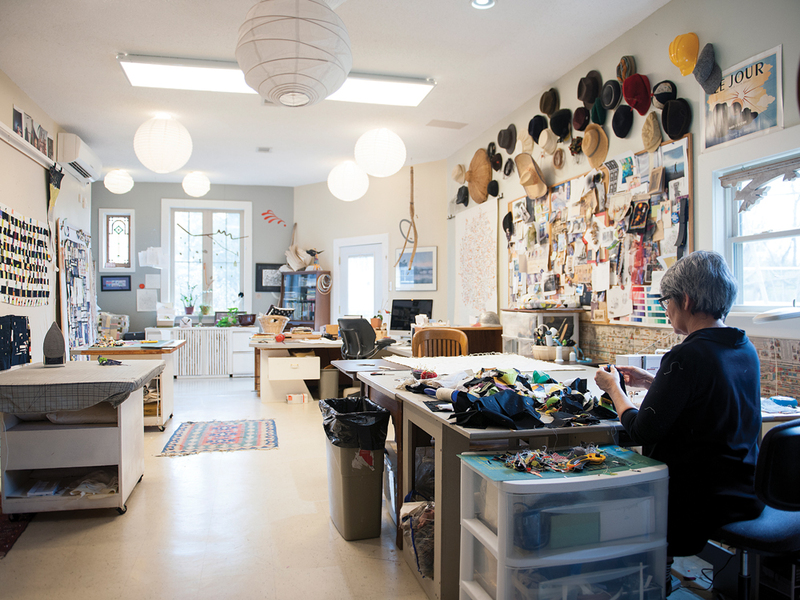 Sometimes, when she’s deep in the flow of stitching a quilt, Paula Kovarik will tap into what she has come to think of as a fourth dimension. 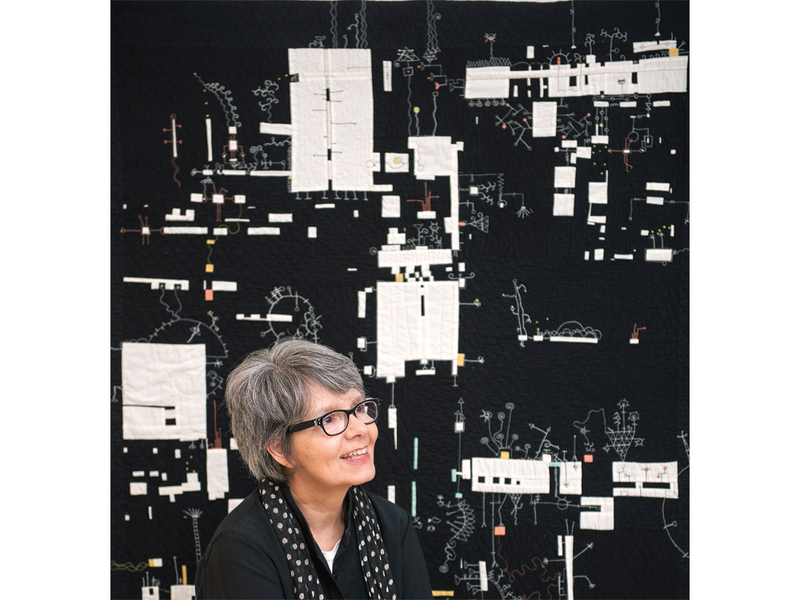 Maybe it’s that extrasensory zing that makes her quilts so engaging, pulls us in. Certainly it’s the amazing stitchery. 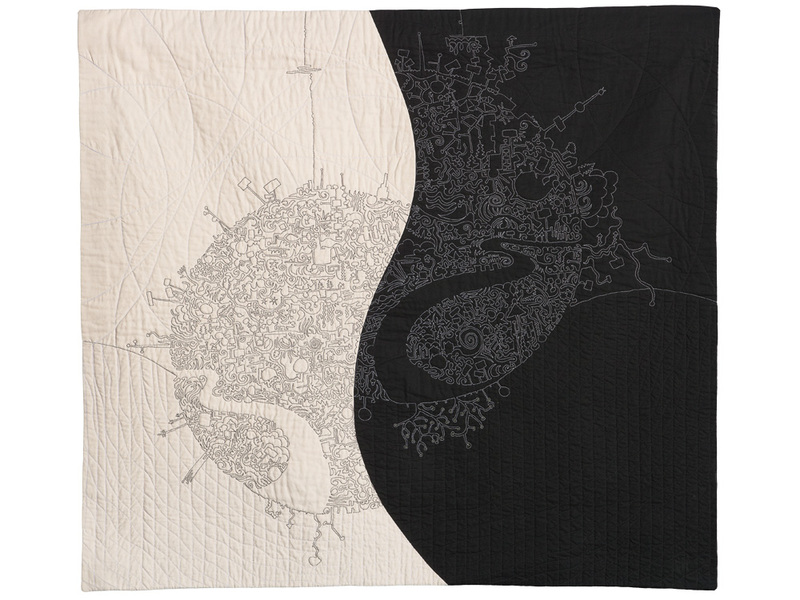 Kovarik draws with thread, using the quilt as a canvas for incredibly detailed worlds, crammed with odd little shapes, structures, and creatures, real and imagined. Her style could be described as a mash-up of Dr. Seuss, Kandinsky, and Where’s Waldo, yet it’s all her own. 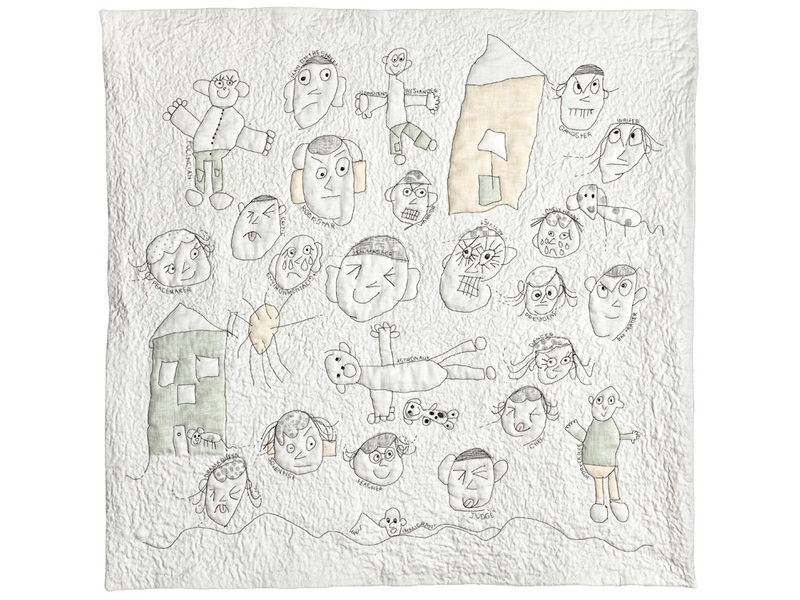 Quirky as they are, her quilts explore big ideas about love, psychology, nature, politics. The unifying thread, so to speak, is the notion of life as a complex web of seemingly random energies and events, things that connect in ways both obvious and unexpected. 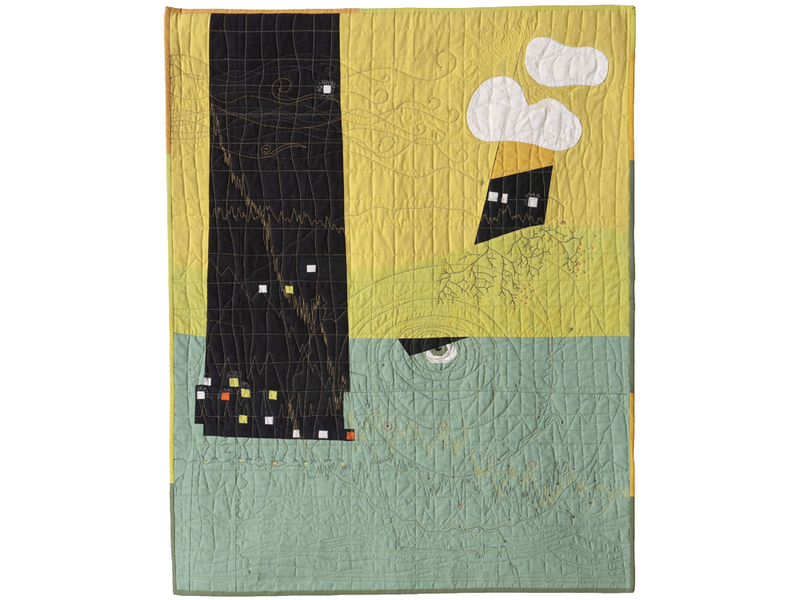 Some of her most heartfelt quilts are about the natural world. “Nature provides us such beautiful chaos,” she says. 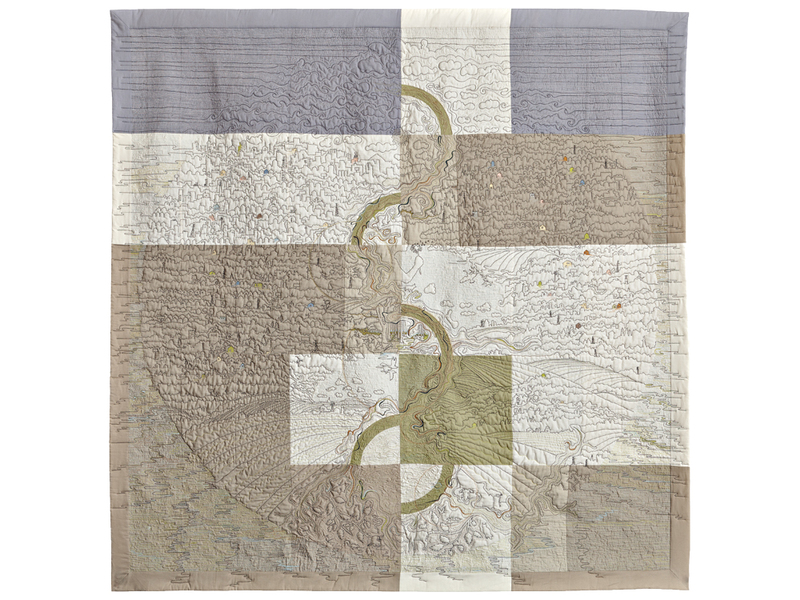 “I’m constantly amazed by the intricacies of natural forms, how certain ones are repeated over and over again.” In Stream of Consequences (2013), her homage to the work of Memphis’ Wolf River Conservancy, stitches form rhythmic, textured swirls over a changing landscape of city, suburbs, farmland, and wetlands. 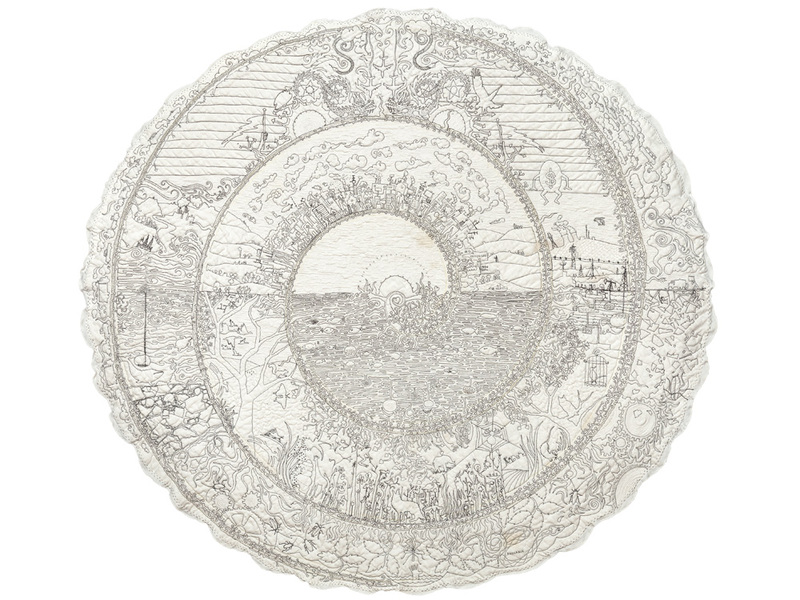 For Round and Round It Goes (2012), she transformed a stained white tablecloth into an epic vision of Earth in the balance, the effects of human vagary – war, pollution, economic collapse – on every imaginable resource and living creature. 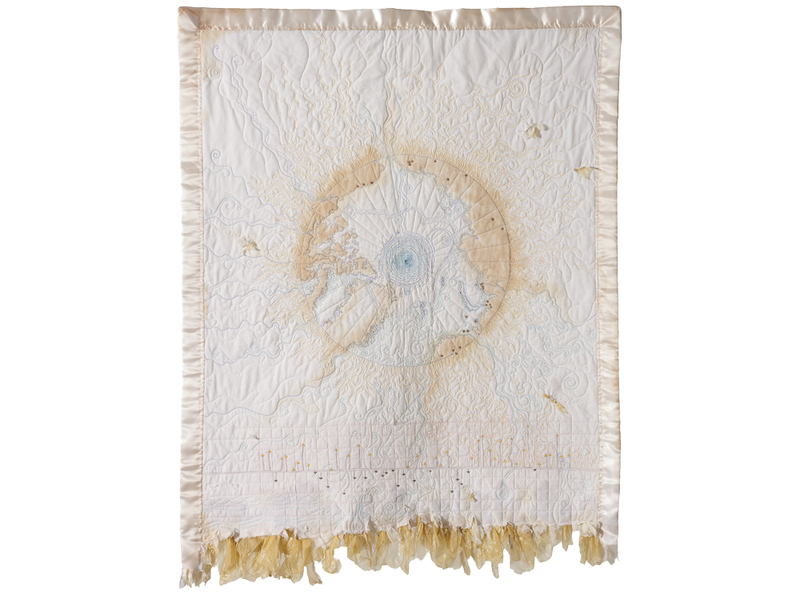 In Global Warming, the Great Unraveling (2009), frayed edges and a satiny border made from a worn baby blanket lend tenderness and emotional impact. Other pieces ponder modern life on a more personal level. 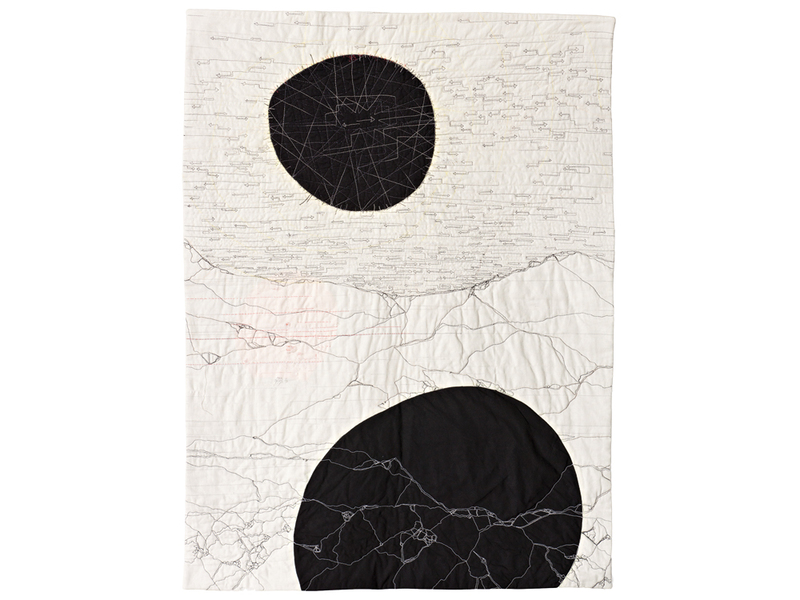 Same But Not (2011) is a yin-yang design: On one side, a single white line travels an unbroken, labyrinthine path on a black background, while on the other, a black thread takes a similar – but different – trip on white fabric. Connecting Fantasy to Reality Proved Difficult (2010) is a meditation on how our best-laid plans morph and change, start as one thing but become something else entirely. 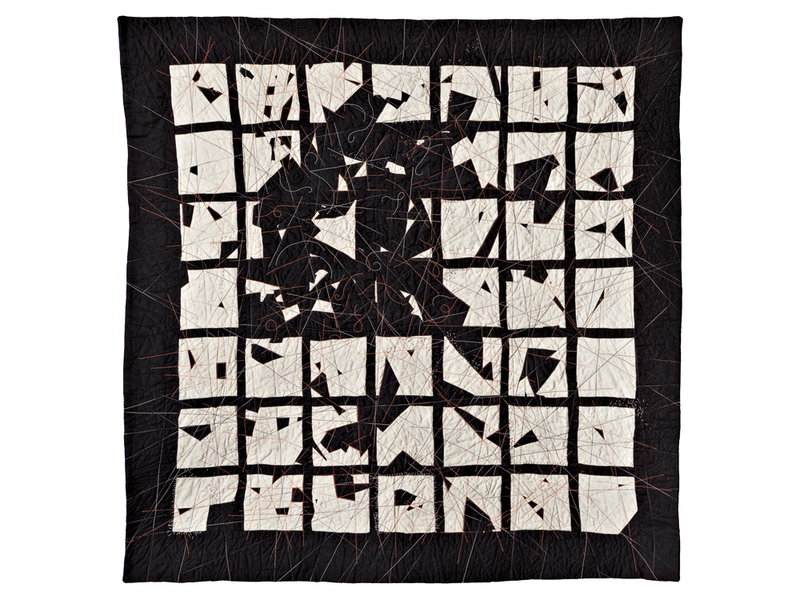 In Worry (2011), large black circles represent the burdens of anxiety, tiny opposing arrows our conflicted thoughts, and fractured stitchwork the mounting pressure of it all. She then begins the slow work of moving fabric under the needle of her well-worn Bernina 153 sewing machine. Pictures and patterns emerge stitch by stitch, maybe a square foot’s worth on a typical workday, “if I’m lucky.” Some elements are recognizable, such as animals or trees. 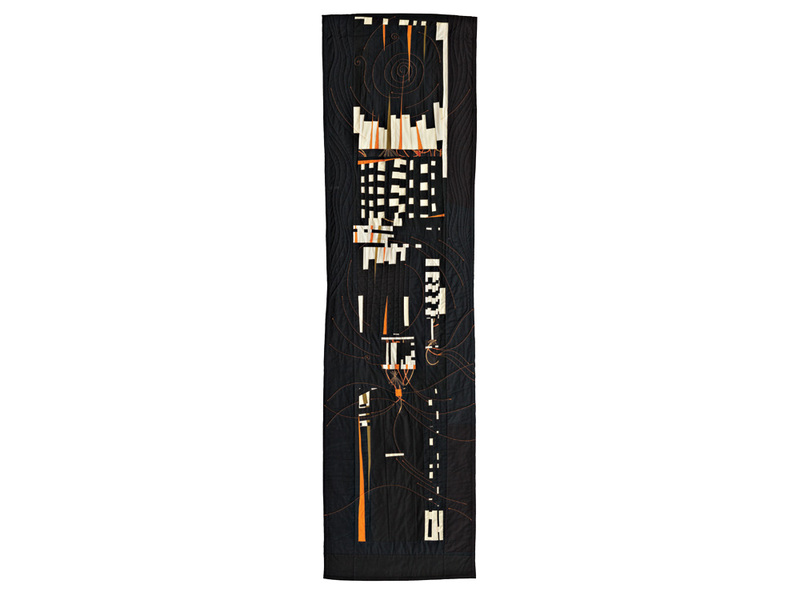 Often, though, Kovarik simply doodles, letting her unconscious, or as she likes to think of it, the thread itself – guide the way, almost like automatic writing. Shapes and forms repeat themselves “whether I want them there or not.” Spirals, branches, ladders, and clouds recur. So do towers, spires, steeples, and antennae, structures that reach for the sky and transmit messages. “I let it be a journey, let one stitch influence the next. I have to let the line have its own voice,” she says of her free-motion method. Kovarik’s own path has had its twists and turns. Born in 1953, she moved around a lot growing up, whenever her father, a Sears executive, got transferred – to Michigan, Minnesota, Indiana, and finally Chicago. She majored in graphic design at Southern Illinois University and married in 1975. She and her husband, Jim, moved to southern Illinois and worked various jobs for a few years; then, like many idealistic young people of their generation, they made an adventure of going back to the land. They bought 10 acres in southern Illinois, designed and built a house, and became vegetable farmers. Then, in 1981, their 3-year-old son, Damien, was diagnosed with leukemia, and everything changed. “We were lucky enough to be handed over to St. Jude’s. We had no money, no insurance. They covered everything,” Kovarik says of the famed Memphis hospital, a “mythical, wonderful place” where children are treated regardless of a family’s ability to pay. After three years of chemo and radiation, Damien was declared cancer-free. Today, at 36, he has two boys of his own and works for St. Jude’s fundraising arm – “a great circular story,” as Kovarik says. That sudden catastrophe, and eventual miracle, led Kovarik and her family to settle in Memphis in the early 1980s. Jim became a grant writer in community development, while she started her graphic design business; they had a second son, Miles (now 26 and studying to be a nurse). She always did art on the side, painting or knitting or crochet. 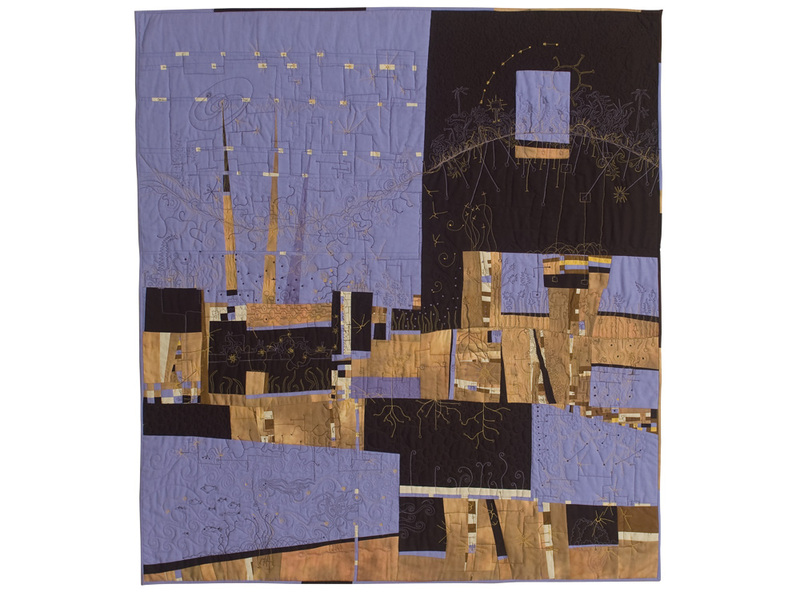 Around 2002, she took up quilting, inspired by her mother, an avid quilter in retirement. She took a six-week crash course at a local quilt shop, but disliked the constraints of traditional patterns. She still finds it hard to say “I’m an artist,” but it’s getting easier. Quilting “has created a passion for me. I’m eager every day to be making, to create things. I’m tireless at it, and I’m also breathless,” Kovarik says. “I’m amazed by the number of things that inspire me now – music, news, daffodils coming up, my kids, grandkids, everything. I have piles of ideas.